Flawless Face and Body Clinic is the preferred aesthetic beauty clinic for face, body, and medical services in the Philippines today, with outstanding achievements in the beauty industry. Philippines today, with outstanding achievements in the beauty industry. Flawless provides beauty solutions for consumers with their medical grade and imported product lines. In the face of these remarkable achievements, Flawless continues to grow and bloom to its fullest potential with the Filipino people in mind. It’s no wonder why Flawless is front-lined by A-list celebrities and favoured by beauty aficionados all over the nation. 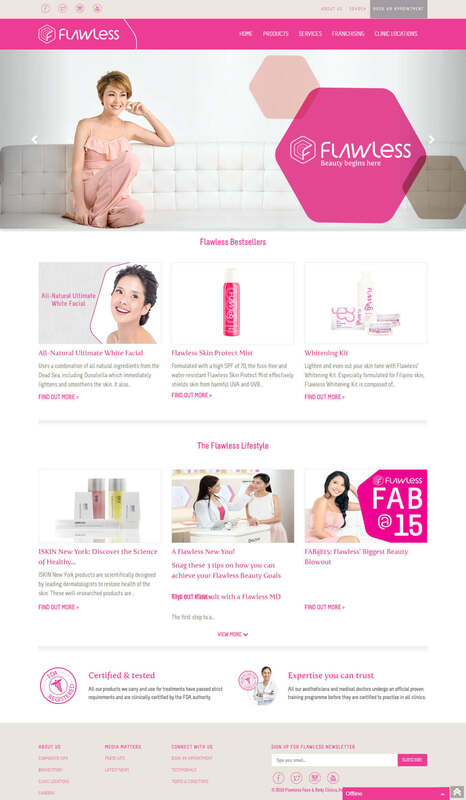 As their online partner and website provider, ViiWorks is one with Flawless in realizing its promise to deliver medically sound beautification products and services to the Filipino people. We provided them with a website that visually appeals to their target audience with simple and friendly navigation. The website is elegantly designed with elements properly placed to keep it on par with all products and services it sells to the public. In addition, we made sure that it cuts through the noise by making its design responsive in different screen sizes, coupled with our SEO and social media tools.